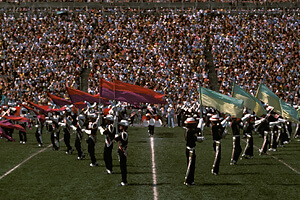 The 1980 Madison Scouts perform in Allentown. The DCI Eastern Classic in Allentown, Pa. has long been a hotbed of competition and has served to launch corps toward the DCI World Championships. Many a corps' fortune has been given a boost at the shows, and those in the stands of the venerable J. Birney Crum Stadium have been treated to some of the most exciting races in drum corps history. Held in Allentown since 1977, the show was once a one-day event featuring Prelims and Finals competitions before morphing into its current two-day format. Here's a timeline of 10 memorable moments from DCI East competitions past and present. The first DCI East Championship (as it was named then) in Allentown featured a long rain delay for Prelims. Tickets for Finals were priced at $4, $5 and $6, with both Prelims and General Admission tickets at the Finals priced at $2. Bayonne New Jersey's Bridgemen would take first against a field of nine other corps, besting the Phantom Regiment 83.30 to 79.60. 27th Lancers handed Blue Devils its only two losses of the 1980 season in Prelims and Finals, reversing the outcome from the CYO Nationals in Boston two days earlier. A week after Allentown, Blue Devils would be back on top, taking it all at the DCI World Championships in Birmingham. In the first of only a handful of years that DCI East featured a separate "Class A" (now known as Open Class) competition, Les Chatelaines of Laval, Quebec topped a lineup of 16 other corps. The Class A corps scores ranged from 20.95 up to 55.40. Santa Clara Vanguard outscored the Garfield Cadets by 2.20 in Finals, after tying the corps in Prelims. Cadets, with many changes thrown into their show the last two weeks of the season, came back two weeks later to win the World Championship in Madison over SCV by 1.20 points. After finishing third at the DCI South event in Birmingham one week earlier, placing behind Santa Clara Vanguard and Star of Indiana, the Cadets of Bergen County beat both corps in subsequent shows and raised tensions in Allentown. Fans wondered if the corps would also fall to the Blue Devils, but Cadets' win at DCI East helped set up the corps' sweep of all three shows at the following weekend's World Championships in Buffalo, N.Y.
Southwind on the field at the 1993 DCI East event. 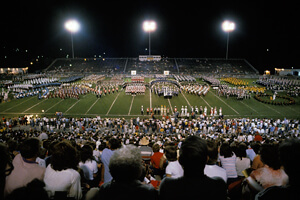 This was the first year of the Friday and Saturday DCI East shows, with separate lineups each night. Cadets of Bergen County competed on Friday night and then hurried to Atlanta to perform as part of the closing ceremony of the Summer Olympics just two days later. DCI East temporarily moved to Philadelphia's Franklin Field because J. Birney Crum was undergoing major renovations. When the corps returned in 2003, they were met with new turf field that replaced the bumpy grass that had plagued marchers in previous years. After the event moved away from its Prelims/Finals format, Glassmen became the only corps to have performed their competitive show in Allentown twice in a single day. After taking the field, a torrential downpour opened up and the corps was stopped mid-performance to seek shelter. The crowd went wild. After a rain delay, the corps members performed their show again, finishing in sixth place. Only three DCI corps have eclipsed 96.00 points in Allentown; Santa Clara Vanguard in 1998, Blue Devils in 2001 and the Cadets, earning the highest Allentown score ever of 96.225 in 2005. Building from that performance, the Cadets would soon finish the season tying the highest score ever at the DCI World Championship Finals, 99.15. 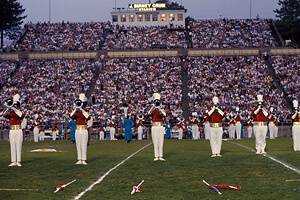 The 2008 Cavaliers at J. Birney Crum stadium. During the Friday night DCI Eastern Classic show, the Cavaliers broke a Blue Devils undefeated streak that dated back to August of 2007 by a quarter of a point. That defeat would come just a week before both corps fell to Phantom Regiment at the World Championship Finals in Bloomington, Ind. Ticket packages for the 2013 DCI Eastern Classic in Allentown are now on sale through the DCI Box Office. All of DCI's World Class corps will make their way to the venerable J. Birney Crum Stadium for two nights of competition on Friday, Aug. 2 and Saturday, Aug. 3. Allentown is an easy drive of an hour or two from so many of the East Coast's largest metropolitan areas, and the stadium is easily reached from a variety of major airports. The shows are also legendary for offering the best accessibility to view the corps in warm-ups and for immersing fans inside the two rows of trucks and buses that line the street outside the stadium, making drum corps as personal as it ever gets. Based on what we've witnessed from prior DCI Eastern Classic events, on and off the field, the Allentown experience is something you won't want to miss. Order the two-day ticket packages now to get the best seats available. 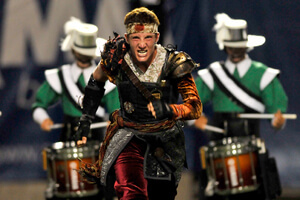 Learn more about purchasing tickets to the 2013 DCI Eastern Classic.